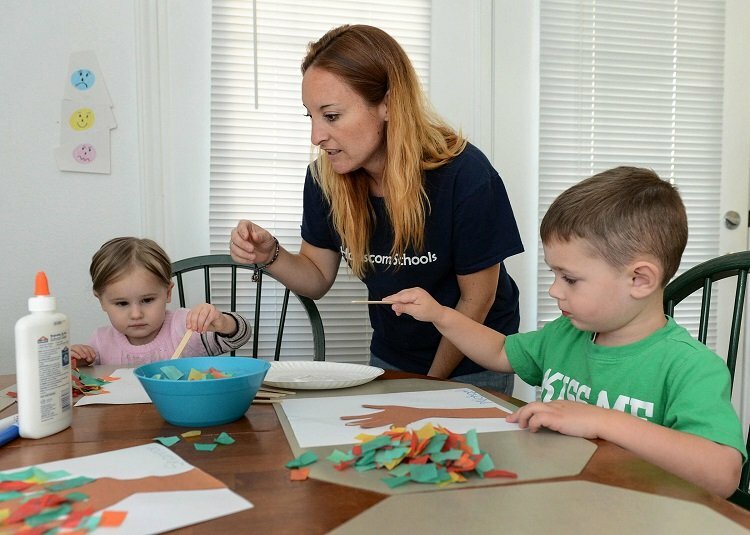 In the era of two income households, parents rely heavily upon nannies or babysitting services. Babysitting can be a fun job and can help you earn some good cash. Whether you are 13 or 30, here are some easy ways to advertise your babysitting service. You need patience and creativity when it comes to babysitting. If you are a teenager looking to make some cash, you must first be able to convince clients/parents that you are capable of being one. If possible, volunteer at local libraries or hospitals first where you can learn to work with kids. This will give you many insights into what babysitting entails. Once you have acquired these skills, demonstrate to the clients how you can manage emergency situations. If needed, get a few recommendations from parents to show how you have managed situations patiently and calmly. Understand that being a babysitter entails pushing a pram, warming the milk bottle, dispensing love and discipline, giving warm baths and even scrubbing the markers from the living room wallpaper. So be prepared to do everything under the sun! Prepare yourself for all kinds of scenarios. If needed, read some child care books to acquire some more skills. Include your phone number on vertical strips at the bottom of the babysitting flyers that you will put up across the neighborhood. When you want to get a babysitting job at 13, you might have to limit yourself to advertising only on lamp posts in your area. But for older sitters, advertising on babysitting websites may be more profitable. Following babysitting websites are great for finding jobs around your zipcode. Zum-This is a great service for transporting kids around-not just babysitting. Some of these applications are not restricted to babysitting-they also help you earn by doing chores like grocery shopping, laundry etc. These apps work wonderfully for parents looking for sitters as they actually get to connect with other parents/ friends as well as their sitters to create an entire community of known sitters. Apps increase options for parents who might have to look for sitting services at the last minute; and that translates into more business for you. If you are seriously considering babysitting as a full time job, then you could create your babysitting website or Facebook page. In the old days, we would hand out cards to clients; today, you say the same thing through social media, websites and blogs. You need not shell out a huge amount of money for this; just use any of the free app/blog/website making platforms and advertise on them. Upload plenty of photos of you interacting with kids-this can create a great impression on future clients. Encourage clients to leave reviews on your page. Share relevant links on the page. Watch what you say! Keep discussion alive by getting people to comment. 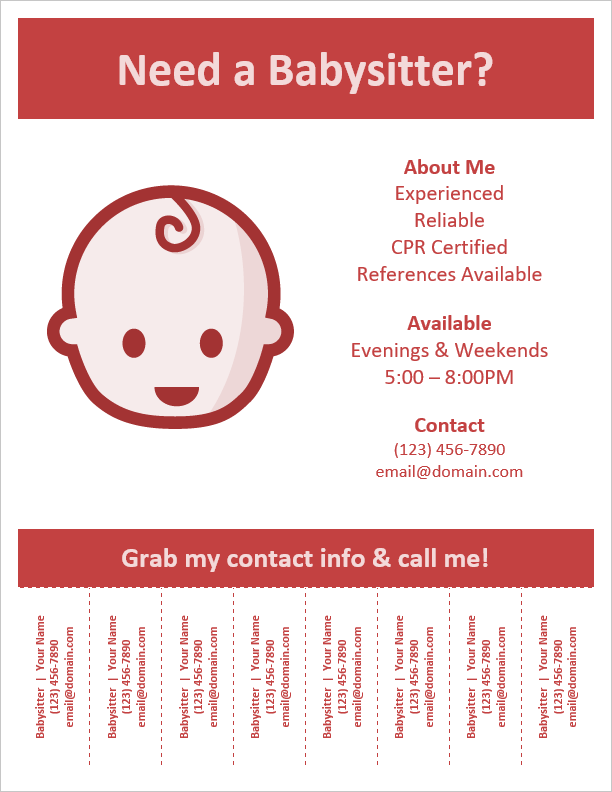 You can easily make beautiful business cards for your babysitting business. Print your name, phone number and/or email addresses on them. Make sure the card is small enough to fit in your pocket. Distribute these to your existing clients. They need not be elaborate-simple business cards with flowers and birds/babies with a beautiful font will do. (Example: Need a babysitter? Hire Sammy 987-654-3210). You can also ask your neighbors to distribute your cards around. (Note: young kids/teens looking for babysitting jobs must take a grownup with them to distribute those babysitting flyers/cards door to door). Safety first! A simple way to get babysitting jobs is to simply talk to other nannies or babysitters nearby. Ask them if you could fill in for them one evening when they are unable to. This is ideal for 13 and 14 year olds to get an idea about what the job entails and they can get all the experience they want without being obliged to do something they may not want to do. This is a good way to acquire clients for teenagers looking for babysitter jobs. Ask your parents to recommend you to their friends. This is a great way to get that coveted first job. Post your ads in the community newsletters or local papers. Even if you do not have the budget, glancing through these ‘wanted’ ads can give you many leads about jobs. Many parents post ‘sitter wanted’ ads in these publications. If these approaches do not work right away, remain patient. Keep your eyes and ears open and an opportunity will soon come knocking at your door!